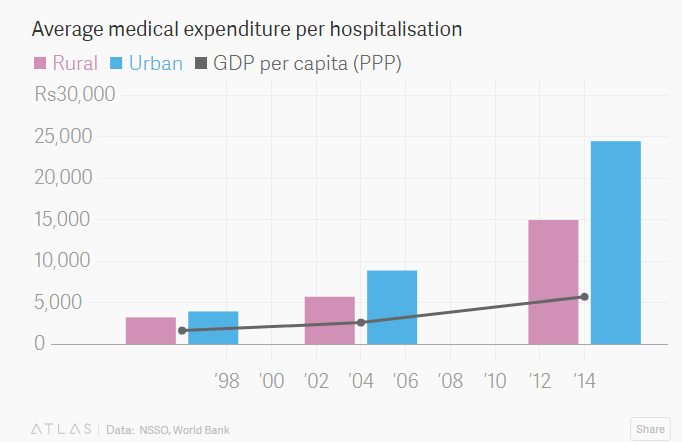 In last few decades, India saw drastic improvement in healthcare sector. Life expectancy rate has also improved and complete eradication of intricate diseases has been made possible in India. 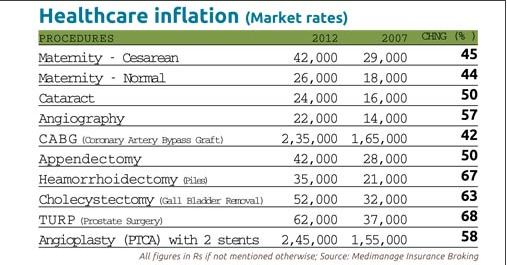 However, with improved standard of healthcare, the cost of treatment has also increased at a breakneck speed in India. Since, Indian Government contribute very little to public health service, standard of treatment hasn't advanced in Government hospitals and other health facilities compared to private facilities such as nursing home. Having dissatisfied with inadequate and improper infrastructure of treatment, most of the Indians nowadays are resorting to private healthcare services. The scenario, however, was completely opposite couple of decades ago. 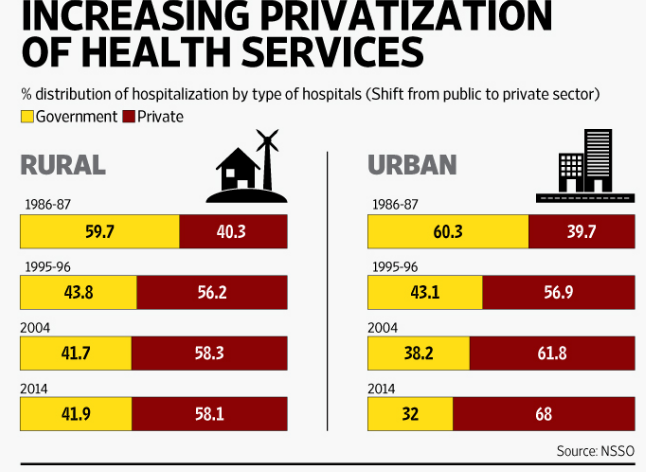 According to the surveys by NSSO (National Sample Survey Organisation) , the trend of preferring private healthcare facilities to public healthcare began in the decade of 1990s. In the urban sector, the number of people availing public healthcare fell from 60% in 1986-87 to just 32% in the year of 2014. In the rural sector, the number of people availing public healthcare fell from 60% in 1986-87 to 41% in the year of 2014. Quite obviously, the out-of-pocket expenses also increase with the increasing rate of private hospitalization in India. The hospitalization expenses rose by almost a whopping 6 times in a period of two decades. According to NSSO report, people in India had spent Rs.3,561 on average per hospitalization in 1995-96, the average hospitalization expense rose to Rs.18,268 in 2014. Out-of-pocket expenditure is the main reason why a significant portion of treatment seekers fall to BPL category. The pathetic condition of public health centres force patients turn to private healthcare facilities. With increasing dependence on private hospitals and nursing home, the cost of major treatments in India has also risen at a rapid pace. Let's take a look at the rise in cost of some treatments in just 5 years. Treatment of cataract which cost Rs. 16,000 in 2007, increased to Rs. 24,000 in 2012. In 5 years, the cost of cataract treatment has risen by a staggering 50%. Such exorbitant medical expenses lead to financial stress for those who are not safeguarded by any health insurance in India. In spite of such high and constantly accelerating healthcare costs, 82% and 86% Indian patients from urban and rural sectors respectively do not have any type of health insurance in India. In this day and age when medical expenses are increases at a speed of lights, health insurance is not a necessary. It saves you from enormous out of pocket medical expenses by providing extensive coverage and a plethora of additional benefits for a reasonable premium. Let's take a look at some of the key reasons why should you buy health insurance online in India. All health insurance plans in India cover expenses during hospitalization. Apart from the cost of treatments, a wide range of miscellaneous costs incurred during hospitalization such as cost of oxygen, anesthesia, fees of surgeon, nurse, rent of room, OT charges, ambulance services are taken care of by medical insurance policies. Some medical insurance plans also cover convalescence benefits as well. Most providers of online health insurance in India come with a strong network of hospitals across India that offers cashless treatment facility. You can also avail the required treatment without having to pay a penny from your own pocket by resorting to any of the hospitals in your vicinity that comes under the network of your chosen insurer. In case you avail treatment from any hospital which is not in the network of your heath insurer, you can still get all your expenses reimbursed later. Health insurance plans in India are designed for individuals, families, senior citizens. You can pick any one of these type of health insurance plan depending on your needs. If you have a family to look after you can keep your entire family covered under a single coverage by availing a family floater health insurance plan in India. If you have elderly parents at home, you should buy senior citizen health insurance plans for them separately. And, to cover yourself, individual health insurance policies are also available aplenty in India. You can also pick any coverage amount that suits your purpose. 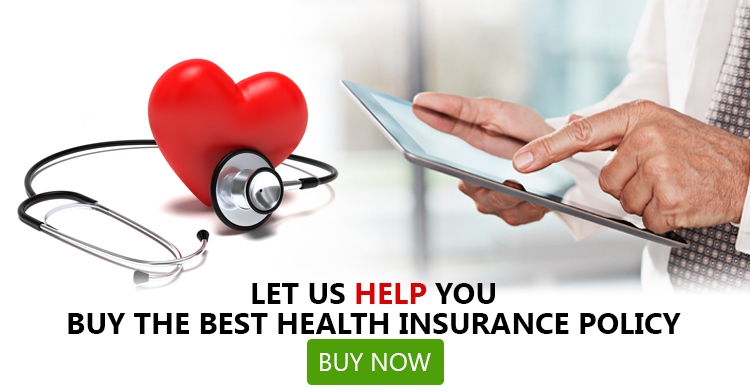 Most health insurance plans in India come with a wide range of Sum Insured to choose from. If you are opting for a family health insurance policy, you should go for a higher coverage amount as you have to keep treatment cost of multiple members of your family in mind. Thanks to advancement in medical science, all treatments don't require 24 hours of hospitalization now. Health insurance policies also cover those outpatient department (OPD) expenses. You can keep these costs covered as well if you go for a comprehensive mediclaim insurance policy in India. Having understood the needs of customers, health insurance companies in India have come up with some new benefits. Maternity expense coverage is one such benefit. Any health insurance plan with this feature is ideal for newly married couples. Some health insurance policies also cover vaccination expenses of new born baby. The cost of treating critical expense is lot higher. Many a time, people fail to arrange the required money to afford expensive treatments. Some health insurance plans available in India also covers critical illnesses treatments. Apart from providing wide range of coverage, medical insurance plans in India also offer a wide range of benefits to policyholders. Best health insurance in India provides free health check-ups, free doctor's consultation, discounts coupons on various healthcare services and wellness programs. By paying a single premium on your health insurance plan, you can avail all these benefits. Between 2004 and 2014, the average medical expenses per hospitalization increased by 176% and 160% for urban patients and rural patients respectively. If you want to be financially safe and secured and avoid running from pillar to post in search of money in time of medical emergencies, you should consider a health insurance in India. Thank to the growing popularity of internet, you can now easily buy health insurance online from the comfort of your home. You can make payment online using your preferred method. In present times, health insurance plans have come with many beneficial features such as auto-restoration of the Sum Insured, lifelong renewability and various discounts such as NCB. As there are many health insurance plans available with similar features, you should compare health insurance online on GIBL,IN, India's premiere online insurance marketplace. GIBL.IN provides customers with easy comparison of health insurance in terms of premium and coverage on offer so that you can buy the best health insurance in India as per your requirements and budget.